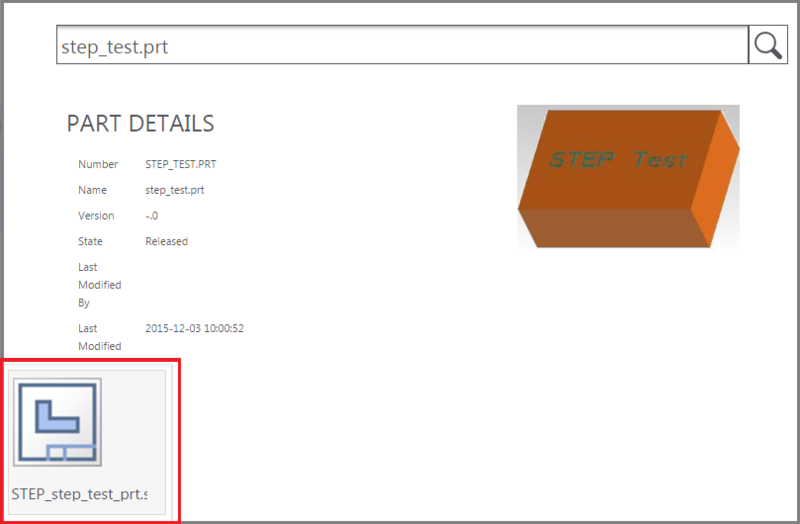 when we load our drawing (pdf) into our PLM software, sometimes our customers request a step file. i noticed that now, you can create the step file, and automatically attach it to the documentation in Windchill. however, if i do a search for a part, i have no way to actually download the file to my local drive, without opening it into creo, then saving it. is there something i am doing wrong? can i somehow browse to this part? Access it from a stand-alone web browser. Not from the one running inside Creo. if the step file is attached to an EPMDoc, then go to the info page fro the EPDoc, then go to content, and under secondary content should be the step file. You can download directly from there. we use creo, and windchill. but we dont use windchill as our PLM, for purchasing, and BOM. we only use Windchill as the vault for our parts. check in, check out, revise. we have a seperate software that we use for BOM, purchasing, and such. so, when i create a drawing, i export a pdf, save it locally, and attach it to the other program via a pdf. sometimes customers request step files of the part for programming purposes. our purchasing department then emails me, and asks for it. where i will go open the part, save as a step, then email the attachment. i saw in windchill, that it could automatically attach it in windchill, so i did some testing, and had some step files created and auto attach in windchill. but, when i search for that part, like simon in his post. 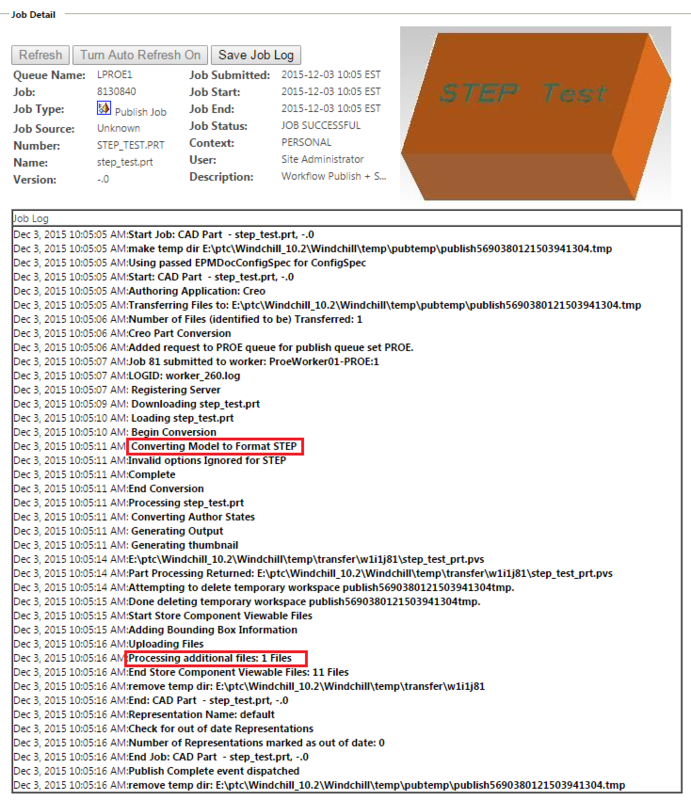 the step files are there, but there is no way for me to download and save it locally to send the attachment. i can only download and open in creo. not save it to my local anywhere. There are several ways to approach this. Here are two of them. 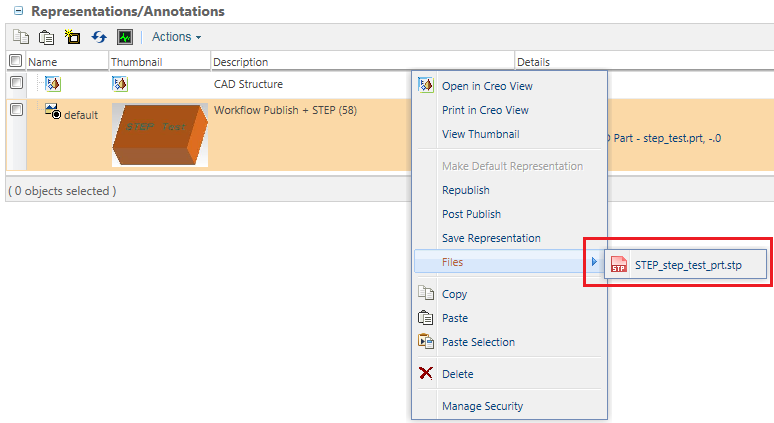 Option 1 - Save the STEP file in Creo as an attachment to the CAD model. This option appears when doing a "Save As" from Creo (when connected to Windchill). 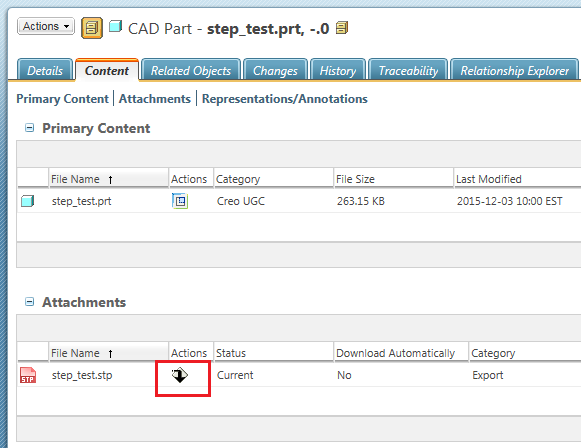 After checking in, the STEP file can be accessed from the objects "Content" tab. There is a download link provided. Option 2 - Configure Windchill to automatically generate STEP files for all CAD models as part of the publishing process (typically after check-in). These files will also show up on the content tab under the "Representations/Annotations" section. Right click on the representation to see them. tom, thanks, and option 1, is the one i am talking about. the download icon, only allows me to download into my workspace.. not.. save step file to local folder to send it out. thanks for the option 2. i will look into that, see if any of that will work. thank you sir.. thats exactly what i was looking for. Thank a lot for your above reply. I am facing problem while opening the files from the Files> I have set as *.dxf,*.iges and *.step file but *.iges file directly opening in txt format instead of download it as remaining follow the same. Do you think this functionality is available when using Inventor? This would be very handy for us.